Because we have such a huge, comprehensive inventory of vehicles, and because our prices are so incredibly low, we get questions about how we’re able to do business as we do. We’ve assembled a list of some of the questions we’re most frequently asked. You won’t find it on a map, that’s for sure. Our lot, you see, is on the internet; ours is a virtual car lot. We went the route of having a virtual car lot rather than a physical one for a few reasons. First, it allows us to be able to offer a lot more vehicles than other car leasing agencies can. Physical car lots really limit what a car leasing agency can offer; a finite-sized lot can only fit so many vehicles. Because our lot is virtual, we’re able to offer a huge inventory of vehicles for our customers to choose from. Second, physical car lots cost money, and when you add those costs together – property costs, property taxes, utilities, insurance, payroll for the people who staff the place – it amounts to a large overhead. We don’t have such costs, so our overhead is small, and a small overhead means big savings for you when you lease. The third reason why we have a virtual lot instead of a physical one is because it allows our customers the most convenient, laid-back car leasing experience possible. You can do your car shopping from your own home, any day of the week, any time of the day or night. No driving around, no pressure, no one else’s schedules to mind. Yes! We work directly with banks and other lenders to make sure our customers get really good deals. Our goal is for the folks who lease from us to have low interest rates, and as-low-as-possible monthly payments. They’re better than merely “competitive”; they’re, quite simply, the lowest around. Having a virtual car lot instead of a physical car lot means we have a much smaller overhead than other companies do, and when we save, you save as well! Coupes, sedans, convertibles, vans, minivans, trucks, SUVs and other off-road vehicles – in other words, just about any new model vehicle you’re wanting. We can lease you any new model made by Acura, Audi, BMW, Buick, Cadillac, Chevrolet, Chrysler, Dodge, Ford, GMC, Honda, Hyundai, Infinity, Jaguar, Jeep, Kia, Land Rover, Lexus, Lincoln, Maserati, Mazda, Mercedes-Benz, MINI, Mitsubishi, Nissan, Porsche, Ram, Smart, Toyota, Volkswagen, or Volvo. 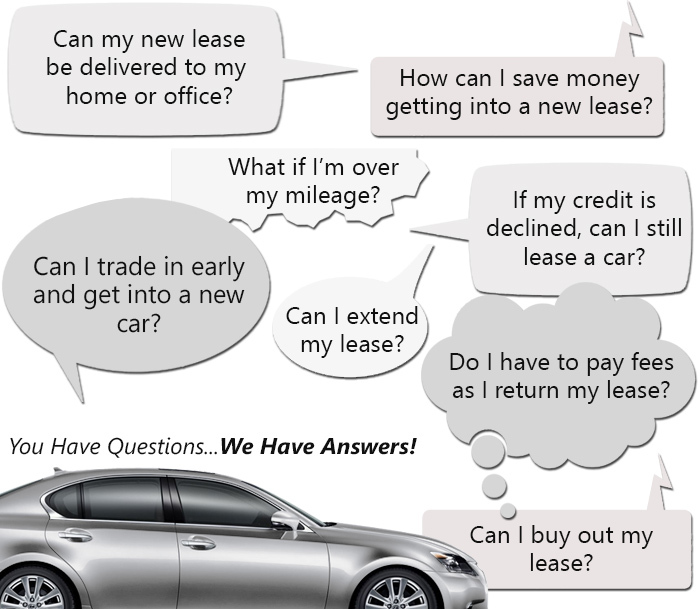 When you lease from other car leasing agencies, you’re always having to arrange rides. You have to bother friends or call cabs first to get to their lot so you can find the car you want. And then, after you’ve arranged a lease, you have to figure out how you’ll arrange to go pick up your new car. With us, though, those worries are over. First, you do your car shopping by touring our virtual car lot on your computer at home. And then, when the day comes for you to drive your new car, we bring it right to your home, office, best friend’s house, or most anyplace else that’s good for you that day. We make things as easy on you as possible! We don’t really have “sales” professionals in the sense of having a staff who’ll try to “sell” you anything. But we do have a great team of folks who love cars and love people and are good at taking care of our customers. If you have any questions, they’re there for you. They’re there for you when it’s time to think about financing. They’re there for you when it’s time for your car to be delivered to you. They’ve just generally got your back, and are good at what they do. Just give us a call at 347-897-5225! We’d love to meet and talk to you!